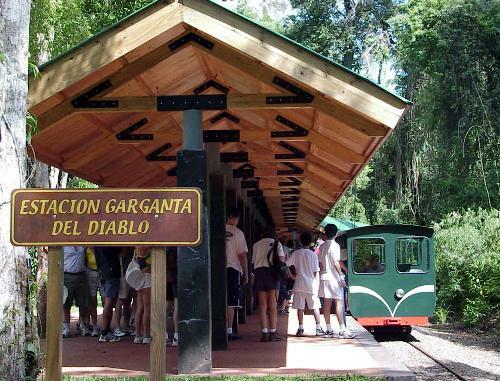 For the movement of visitors throughout the area around the Falls we have made one of our most innovative additions to the park: an ecological train which runs on natural gas. Access: Central Station, Cataratas Station and The Devil´s Throat Station. Length: 14Km Total trip: 25 min. Central Station to the Cataratas Station: 10 min. Cataratas Station to the Devil´s Throat Station: 15 min. Planned exclusively for this park, the design bears in mind the unique characteristics of the area, such as weather and the surrounding natural environment. 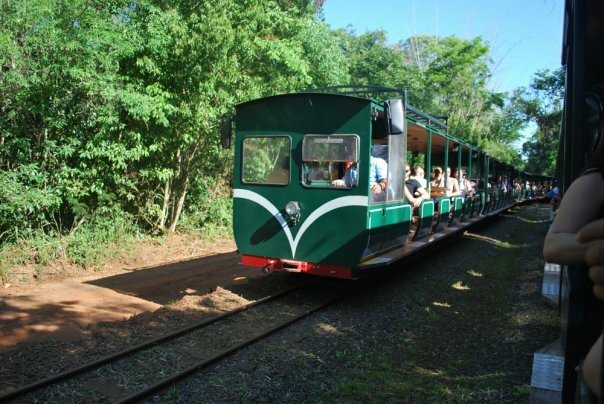 The train is an open vehicle allowing visitors to have direct contact with the environment and live the experience of a ride in the middle of the jungle; sensing the aromas, weather variations and the sounds of the forest. From here the train goes to the Cataratas Station and the Devil´s Throat Station. This station includes bathrooms, a first aid room, park ranger offices, and a commercial area with a cafeteria and a snack shop. At this station the precluding trails to the Upper and Lower Circuits begin and diverge. It acts as a distribution centre with a square, rest area, food services, fast food services, and bathrooms. From here you can access the Devil’s Throat. The station offers a central service square with bathrooms and a fast food store, from which a set of catwalks will take you to the falls. "Truly a Wonder of Nature". One of the most unique sights in the world, you have to experience it to understand its beauty. Stroll under the light of the Full Moon and dine in the La Selva Restaurant. Here.